Each time we drill a new hole we have to first check our equipment on board, so we are confident it will work once it is deep down below the seafloor. In this short clip, the drill rig team are testing the ‘underreamer’ before lowering it through the moon-pool (the 6 m – or 19 ft – diameter hole in the bottom of the JOIDES Resolution). You can see in the video that below the underreamer there is a tri-cone drill bit which will drill into the sediment to make a 9 7/8-inch wide hole (that’s about 27 cm wide). The underreamer above the drill bit will widen the hole to 14 3/4 inches (38 cm) so that we can emplace casing into the hole. The casing will be installed from the seabed to 640 meters below, and will hold the borehole open so that we can safely drill and collect core samples below this, to a depth of over a kilometer. 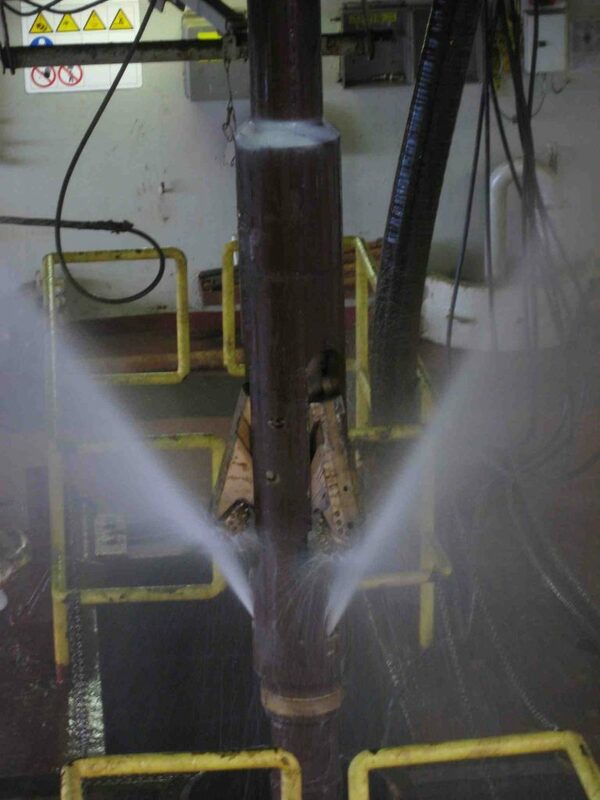 The video shows the standard test we do to make sure that the underreamer opens and closes properly – otherwise it will get jammed in the hole we are drilling, and we won’t be able to drill the borehole or pull up the drill string when we are finished drilling. Once we know the arms are opening and closing correctly, we will lower it to the seafloor and it will begin drilling into the sediment. The under-reamer opens and rotates by pumping water into the pipe. It’s pretty amazing to watch as it spins 85 strokes/minute (requiring 1582 liters/minute of sea water) spraying all bystanders. The under-reamer is rotated by a mudmotor and will help the drill bit advance into the seafloor sediments and remove the debris. It also keeps the drill bit cool as it cuts through rock and sediment.